Correct wheel alignment is essential for the proper running of your vehicle. Proper alignment is will help you get the most out of your tires, and will contribute to the control of the car. Wheel alignment can also affect your fuel efficiency. The correct alignment of your wheel will save you money at the pump. If you have not had your alignment checked for six months to a year then it is time to take your car into a professional who can provide a comprehensive inspection. For decades we have been handling wheel alignment and all other types of repairs for your vehicle. We are truly a comprehensive, cost-effective auto repair and service shop. There are many different ways that your alignment can be affected. Normal daily wear can affect alignment over time or small accidents and curb driving. We will get readings that inform us exactly what to adjust and fix when it comes to the camber, caster, and toe angles. A re-alignment restores your vehicle's components to the correct measurements and make sure that your wheel is straight. At Ali's, we even work on larger trucks and commercial vehicles. Bring in your car today! 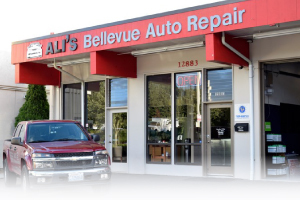 Ali's Bellevue Auto Repair during your alignment inspection we will also check your tire wear and pressure. We handle it all for you in an affordable fashion and we will exceed your service expectations. We are family owned and operated and have been serving the Redmond community for decades. Ali's handles all types of repairs and will hard to get your vehicle adjusted and fixed properly. If you have any additional questions about wheel alignment or any type of auto service call us at 425-450-9713 and we would love to help you!